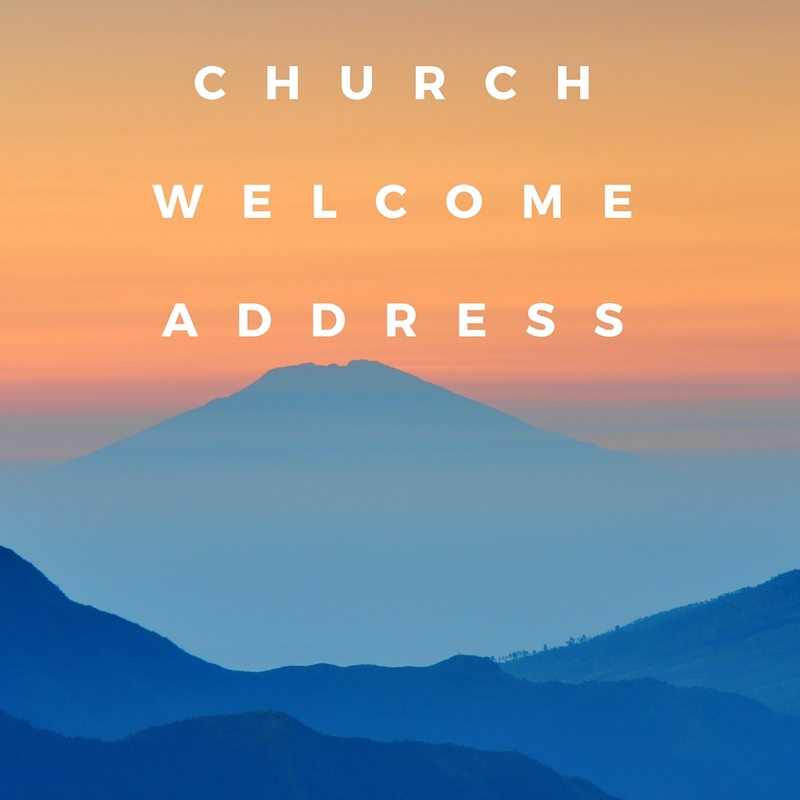 Looking for welcome address for church? I presume this is your first time that you have been asked to prepare and give a welcome address in church. Here is the place you will begin at. Why? Below here we have many samples of welcome address of various occasions in the church that can help you. We also have information that can assist you to get ready for the event, occasion or the church program that is about to take place in church. Let us first look at the various samples that I have prepared for you. Brethren in Christ, I greet you in the name of our Lord Jesus,good morning! Let me thank our Lord who is in heaven for allowing us to congregate here this morning us youths as we fellowship together and listen to the word of God. It is a great opportunity we have been given by our Lord to search and find the will of God. As we begin this program, I want to invite each and every one of you to feel the presence of our Lord and may we be enriched by the teachings of today, thank you and God bless you. What a great honor to welcome you all to this year pastor's appreciation day which is here with us today, we have been praying and asking the Lord to guide us an prepare us for the day, finally we have seen it and want to thank the Lord. As we begin the activities of the day, let us ask the Holy Spirit to guide and help us to finish well. Thank you and feel welcome. Brethren in Christ, I greet you through the mercies of the Lord,How are you? I have a song in my heart that the Lord has given me. I stand before you to thank the Lord for the opportunity and the love He has shown to us to make it possible to have such a wonderful forum here today, as we deliberate and share the love of God. It is my prayer that the Lord guide and help us to finish well. Feel welcome and let the will of God be done. Here is the welcome address to a church parents/youth forum. Let me take this opportunity to thank our heavenly Father for the gift of life, let me also thank the parents present and together with the youths for finding time to come so that we can deliberate and share ideas on how we can relate well. As we all know here in the church the relationship between the youth and the parents need to be bridged so that we can have a smooth working relationship. Feel welcome and Jesus love us. Ladies and gentlemen in Christ,good morning! Welcome to our church service and let me start by thanking our heavenly Father for the wonderful day of worship he has given us today as we congregate and share His love. We have wonderful and heart touching activities ahead of us and want to ask all of you to prepare for your hearts to move closer to our God. As we start the service, let us invite the Holy Spirit to come and fellowship with us. Feel welcome and God loves you all. What a joy to stand before you as I do this welcoming of the great event in our church calendar, to day we are starting this wonderful gospel campaign that is going to touch lives, I want to ask each and every one of you who is present to pray so that we can have the harvest that the Lord has prepare for us. Thank you and God bless you. Daughters of Zion, I greet you in the name of our Lord Jesus,How are you! Let me take this precious moments to welcome you here today as we fellowship together. I want to thank our dear loving Father who is in heaven for the wonderful love shown to us as we begin the program may the Holy Spirit guide and help us as along the way. May the will of God be done as purposed by God Himself. Thank you and God love you. Brethren in Christ, I greet you in the name of our Lord Jesus! Welcome to the day we celebrate the children in our church, it is a day that we are reminded on how to approach our God. Young and old present, we want to thank God for the wonderful opportunity to learn from Him. As we begin may the will of God be done in our lives in Jesus name. It is indeed a great joy to see all of us gathered here today as we share the love of God.We thank God for everything. It is a great honor to stand before you as I share with you the message that the Lord has given me,I count it as a privilege as your priest to be used as a weak vessel in the Lord' s vineyard. Let us continue praying for each other so that the will of God can be manifested upon our lives. May God continue to bless and protect our churches here in our country and around the world at large. Feel welcome and be blessed. You have landed this page as a minister of the gospel or a pastor. You might be a person in a leadership role in a church and you are tasked to provide a welcome address in the church during a service or an event happening in the church. We are here to give you direction on what to do. We shall save you that precious time you have always wanted to have because we promise satisfaction to your desires. If you want samples to inspire you. we have one or two at the end of this page. But if you want a modified speech which is ready to be used and you only change one or two words in it then you need to jump now to this special page and download one for you to use. You will find all the speeches for any occasion in the church. You need to subscribe once and you will use the materials for 5 years. Even if you will not need it yourself but your church need the materials for use. We always celebrate anniversaries in the church and many more. We don't promise to let you down but we are sure of our strength which cut across. We do this on a daily basis. Writing speeches and church addresses is our daily bread. We update this page and the site with new speeches that are inspired by the Holy spirit. If you need a speech to download go to this page and get one that you love to pick. All the speeches and addresses are there for you to use and our work is to make them available for you to have them. If you are not ready for a modified address right now, then you can get inspired by the sample below here. The address below take into consideration that you have the event in the morning and you are in the church for the weekly worship in your church. Your pastor is present and also invited guests are with you. Thank you for the ear and may the good Lord be upon you until we finish in the name of the Lord Jesus Christ. The above is just s ample of what you expect to get in the special page that is created for you and your church.